You “Can’t” Or You’ve Decided You Can’t? My neighbour, Chris is a great guy. We get on well with both him and his wife, Andra. We share many things such as a love of good wine (they have a wine cellar) and good food (I love to cook). We were recently sitting in the garden, mopping up the remnants of a BBQ with a bottle or two of red wine. I can’t remember what we were talking about but at some point, Chris made a statement along the lines of: “I can’t throw”. “I throw like a girl”. Now, don’t send me emails about being sexist etc. I know some girls who throw perfectly well. Andra is one of them. She’s an ex-international Basketball player – she can throw! You see, at first glance, you probably wouldn’t mark him down as an athlete of any kind. Andra clearly has played sport at a high level. She has that athletic grace in her movement that only elite athletes have. However, Chris is a seriously fit guy. This weekend he ran the Oxford half marathon with Andra. They drove to the park and ride, and in their typically disorganised fashion, ran to the start line without knowing exactly what route to take. They’d both left their phones at home so no “maps” either. A three-mile warm-up jog became six miles. They ran the half and then ran back to the car (getting lost again) and drove home. I’ve known them to do this before and then go out for a 50k bike ride in the afternoon because they felt “itchy”. They also do “Ultra Running” in South Africa, although I think that’s an excuse to visit wineries. It turns out that lots of people have tried to teach Chris to throw but to no avail. Lot’s of people aren’t me though. For those of you reading this who don’t know. In a previous life, I was a Tennis Coach. It’s something I did for over 20 years. I can teach people to throw. So, off we popped to the orchard with a couple of tennis balls and a pair of socks. Don’t ask. Half an hour later, Chris is throwing like he’s always known how. Result. You see, Chris, at some point has decided that he can’t do this simple skill. Either a teacher has told him so, or he’s told himself but either way, that decision has become binding. His brain has accepted the words it’s heard and created a reality to fit. I can’t dance, I can’t run, I can’t write copy, I can’t sell, I can’t understand numbers. Now, I accept that some people have challenges based around numbers or dyslexia. In fact, I suspect that Chris suffers from Dyspraxia. However, what inspired this article was that in Chris’s case and in many others, it’s about attitude, not ability. Henry Ford is quoted as saying “If you think you can, or you think you can’t – you’re right”. I used to dismiss this as just words of no consequence. I now believe it’s about as strong a truth as there is. In most cases, your ability to do something is limited to your ability to believe whether you can do it, or not. Unfortunately, ‘can’t’ often stems from ‘don’t’. and don’t is a word we hear often whilst growing up. Whether it’s from parents, teachers or society. These manifests into a hard-wired state of mind about certain activities or skills. Chris ability to throw a ball was more about his insistence that he couldn’t than any physical inability to produce the required action. All it took was a bit of practice once we’d convinced him he could. I play golf. For the last three months, most of the summer I’ve had the “yips” when chipping. I either thin it across the green or chunk it a foot forward. It’s been driving me nuts. Every other part of my game is excellent. I can drive, I can hit great iron shots, I can putt. I’ve told myself I can’t, so I can’t… Even though I know this stuff, it’s still frustrated me when doing something I love. I’ve taken to writing down “I’m brilliant at chipping” and saying it to myself when practising and playing. Guess what? “I can chip”. Sure, I hit the odd ropey shot. But I hit the odd ropey drive and iron shot. I even miss the odd putt! Much of our success is based on whether we think we can, or we think we can’t. It doesn’t matter what the activity is. I hear it from people all the time. Statements starting with “I can’t”. Of course, the more often it’s said, the more you believe it. The more you believe it, the more your brain works hard to make it a reality. Then you can’t do it. Don’t get me wrong, Chris isn’t going to join a cricket team any time soon, but he bloody well can throw. Tell yourself you can, put some practice in and see what happens – you ‘can’ surprise yourself. 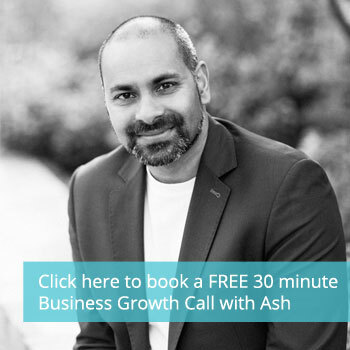 "fantastic input from both Ash and the other entrepreneurs around the table"
I recently attended one of Ash's Mastermind groups which gave me some fantastic input from both Ash and the other entrepreneurs around the table. It was as if I had my own highly creative board drawn from a wide variety of industries to give unique and innovative solutions to my business challenges! "just enough to push me out of my comfort zone and move forwards"